I think it was last fall, I saw a photo of Quilt Market and in that photo was hanging a quilt that I fell instantly in love with. It was in Michael Miller's booth, and so I found out that it was a pattern designed by Tara Faughnan, and available for free on Micheal Miller's website! By the way, Tara has some other free patterns on their website, and can I say I just love everything she makes? 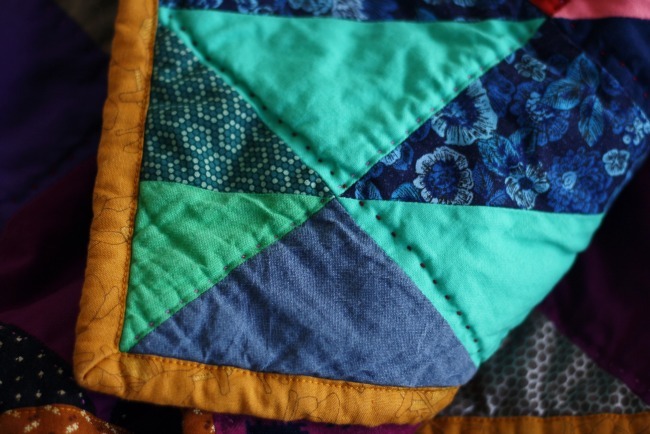 I can't find her blog anymore, but if you search for her online, you'll see that this quilt pattern is a smaller version of her much larger original quilt. 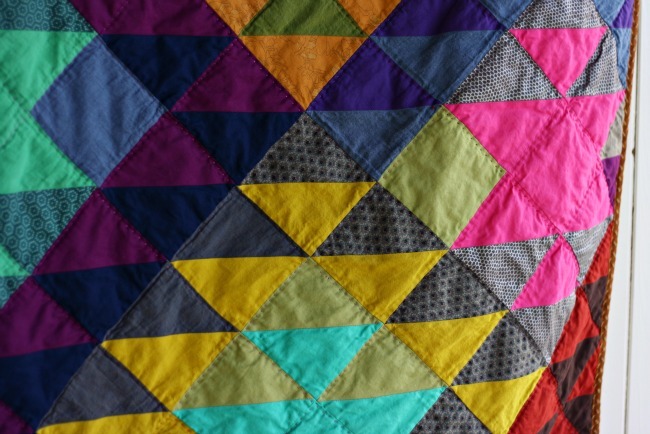 The original quilt pattern was completely made from Cotton Couture Solids which is Michael Miller's line of solid fabric. The pattern conveniently lists all the exact colors used. Luckily I had a color card on hand from the Cotton Couture solids, so I used it to color match as closely as possible to fabrics I had on hand. I stuck with mostly solids, but I strayed over to subtle prints when I didn't have a solid in a close enough shade. This pattern is a lot of half square triangles, but I pieced them all last winter over the course of a few lazy days. I used my one scrumptious piece of Velveteen as backing. Pinned it together and started handquilting it. And then it sat and sat all summer, and now over the course of a few fall evenings I finished up the hand quilting. Let's just say that this quilt is SO my kind of quilt. 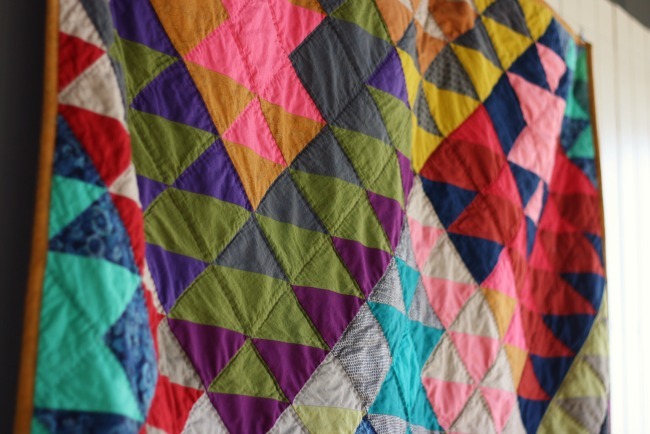 I just love it, the colors and the way they move around the quilt. Thanks to Tara for such a great design! I had almost convinced myself to sell this quilt. After all, I just don't need any more quilts! And then I noticed something sad. Yes, that's right! I had to piece the back, and that crazy Velveteen unraveled at one spot. I pieced this back last winter, so I don't remember how I did it, although I know I will have used a 1/2" seam. Obviously that wasn't enough, and I should have serged it as well as used a larger seam width! 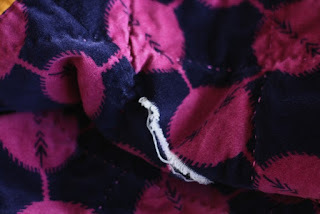 Even if I could come up with a good way to fix it, I don't feel good about selling it as the seam runs the entire width of the quilt, and I don't know how close to unraveling the rest of the seam is. So it's an easy decision! This one is staying here, and I'm really happy about it:) I haven't decided yet how I'll fix it, but maybe I'll fray check heavily along the exposed seam and then hand sew a cute little patch over it? Wow. Just, wow. That is really amazing. I've totally got to get more precise & figure out how to match up my seams before I could do this one. 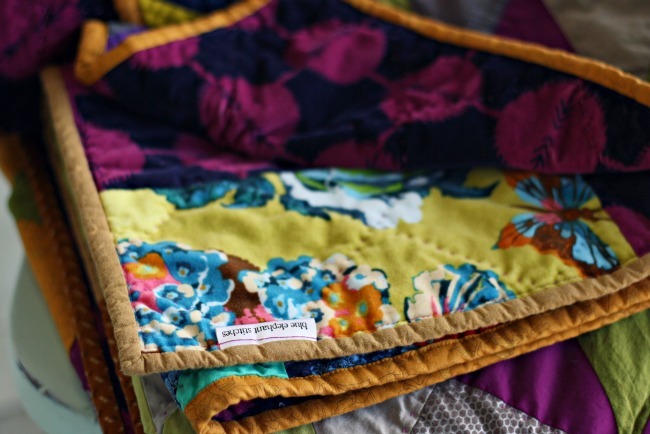 This quilt is absolutely gorgeous! Totally inspired to try this pattern. Absolutely beautiful! Thank you for sharing and have a wonderful creative day! So sorry about the seam. What a bummer. The quilt is stunning none the less. really pretty! I love this pattern. I've seen the kit for it at Keepsake but haven't broken down and bought it yet. How did you make the triangles? This is a wonderful and stunning quilt and.... oh this pink!!!! congratulations! Had to stop by.. Saw your pics on Facebook via A Quilter's Table.. The colors are gorgeous!! Love everything about it. Stunning!!!! I love EVERYTHING!!!! about this quilt. It's perfect in every way. I'm so pleased to see your quilt. I fell in love with it at QuiltCon and even got photos of me taken standing in front of it! I love the colours and the design. Very serendipitous piecing problem on the back so that you got to keep it - how could you possibly give it away! :) It is on my too long to-do list. Your beautiful work never ceases to amaze me. A cute little patch would be a great fix. What a gorgeous quilt! I love the vibrant colors! I am glad you get to keep it. A patch on the back is a brilliant idea. I love this quilt! Your work is always inspiring. And what a blessing that you are forced to keep it, although if you patched the back, that would lend to it's charm, and I am sure you could find a buyer! I love that pattern. Phooey about the seam, but it's a lovely quilt to *have* to keep! 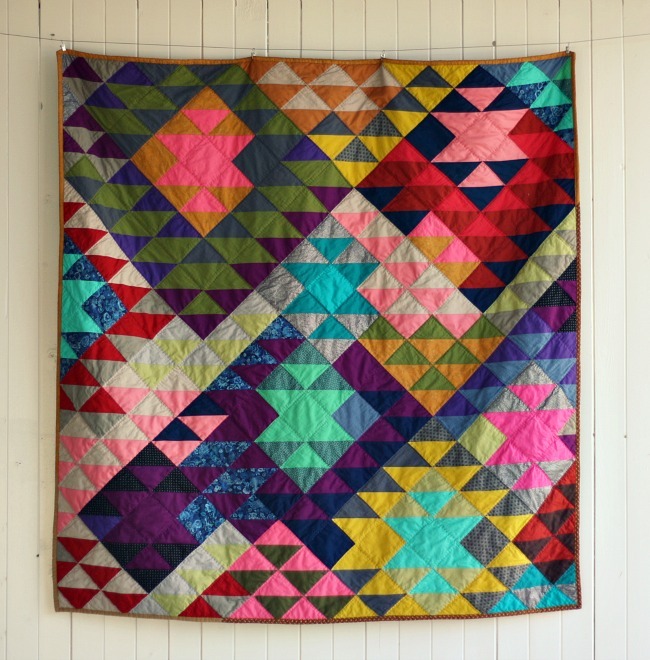 Such a beautiful and quirky quilt, love it! This quilt is truly stunning. I'm happy for you to keep it! I just came across a picture of this on Pinterest. 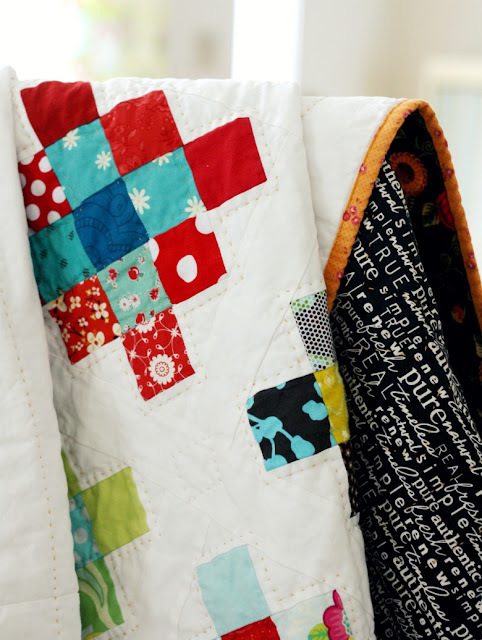 I love what you did with this quilt! Glad you enjoyed the process, sorry about that seam though. Jolene - I can't believe I didn't write a comment as soon as I saw this. (I'm back for my third visit to look at this quilt). I love the colour intensity, and I love that you backed it in the velvet - that's a rich and comfy choice. I hope you do the hand stitched patch, all the more special. I absolutely love this quilt! But then again I love everything you make :) you have been such an inspiration for me on my quilting journey, thank you for sharing!